I am a New York-based writer, travel lover, and author of The Drive North and Destination Paranormal. I have several other books in the works, including fiction. I went sightseeing in Prague after I left a RIAS Berlin Kommission meeting at the German embassy to the Czech Republic, high on a hill in what is known as Lesser Town in Prague. It was a rainy and chilly afternoon, but there was a lot to see in one of Europe’s most vibrant and historic cities. And I couldn’t let a little weather stop me now that our morning full of meetings was at an end. Our group left the embassy, the site of a mass exodus of East German refugees from behind the Iron Curtain before the 1989 revolutions. We were headed up the hill, careful not to slip on the cobblestone streets, toward the Prague Castle – the official seat of the Czech president. It would be there – with a commanding view of the city – where we would begin our walk on Prague’s Royal Route. 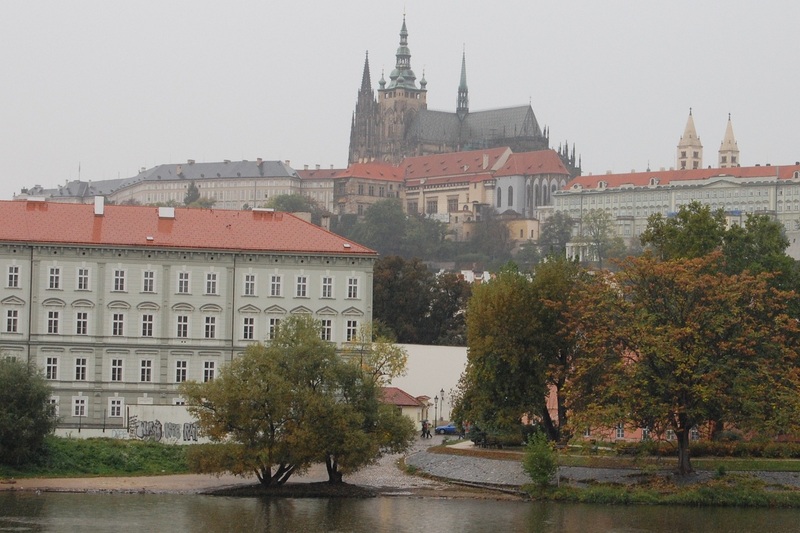 Long ago a traditional route to the Prague Castle was taken by Bohemian kings after their coronation. It is also the path most visiting dignitaries took when entering the town. This is because it was an impressive avenue of sites, passing through the old city gate, Prasna Brana, and through Old Town, across the Charles Bridge and on up to the castle. Today it is just as impressive as it ever was – even walking it backwards. Our group, fracturing along the way into smaller parties, slowly walked down the hill which the castle sits upon. We crossed the Vltava River and came upon the Charles Bridge once again. With a few moments of free time the night before, we walked to Prague’s Old Town and took a moment to sit on the bridge and enjoy the evening. The darkness surrounding the city only seemed to enhance the atmosphere. It was a bustle of tourists snapping photos and trying to look sheik and interesting in an area that appeared to be avoided by locals, save those who worked in the area selling their wares to the throngs of people who flock to the city each year – over four million annually. It was an exciting feeling, so I savored each minute I had available. We passed by the Charles Bridge and wound our way through the maze-like streets of Prague’s Old Town. The rain was persisting, so our small group stepped into a warm restaurant for a cup of soup and a hot drink. It was a nice and – dare I say it – cozy way to take a break from our walk. It fortunately also allowed enough time for the rain to pass by overhead. With a new reserve of energy, we continued on to the Old Town Square, stopping only for roasted glazed pretzel snacks. 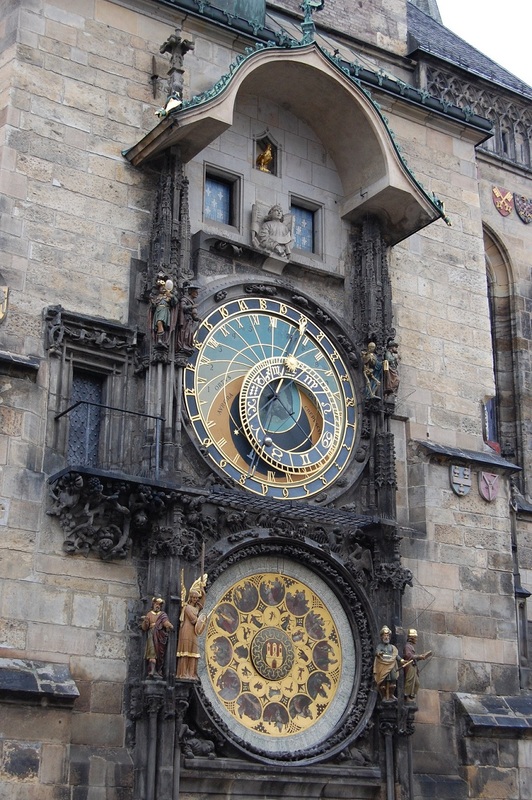 We had stopped the previous night to witness the tradition of the astronomical clock (above) performance. It was anti-climactic, not nearly as exciting as we had hoped, but fun to watch as the little figurines danced out on the clock’s face at the top of the hour. We laughed this day at the recent memory and continued on into the square. The flavor of fresh roasted pork clung in the air. I wanted a sandwich, but refused since I could already taste it in my mouth. Several other small shops that weren’t there the night before were set up adding to the buzz of the day. Ducking in and out of the tents, connecting with other members of our larger group, we took in the day in the shadow of the Gothic-designed Church of Our Lady of Tyn. 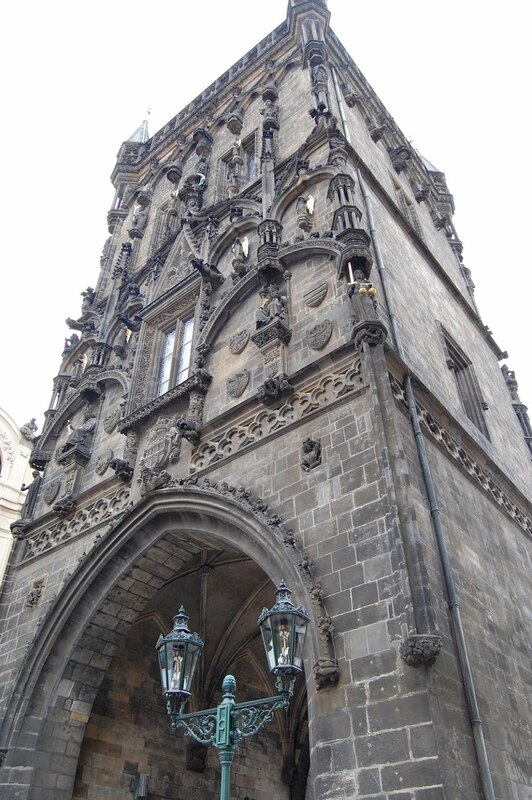 The Church of Our Lady of Tyn dominated Prague’s Old Town Square, drawing attention away from the astronomical clock and old town hall. None of us had heard of it before, either, so we were flustered and speculated about what it was and how it looked so beautiful. Had there been more time, we surely would have made the Baroque-decorated interior our next stop. Instead, needing to begin making our way back to our hotel and on the Belgium, we continued on walking the old Royal Route – taking one last look back at the Old Town Square. Back in Lesser Town, in the shadow of Prague’s Castle, we had earlier skipped a chance to tour Franz Kafka’s home. None of us were huge fans. But as we ducked into a couple of shops on our way to the Powder Tower – the Prasna Brana – I suddenly became curious and picked up an English translated compilation of his work for later study. It was my souvenir from my one day, a dreary and cold afternoon, in the Czech Republic. We picked our way back through the winding streets to our hotel. It was amazingly easy to find amongst the zig zagging avenues. We stopped as time allowed, snapping our last photos of interesting looking buildings and impressive sculptures; the artist’s names would likely always remain a mystery. It was the perfect afternoon for a Prague tourist, yet lined with saddness; we wanted more time to explore the city. But it would have to wait for another time.